Tyrone Corbin is the head coach of the Utah Jazz in the National Basketball Association. He was installed as head coach on February 10, 2011 following the resignation of longtime coach Jerry Sloan. 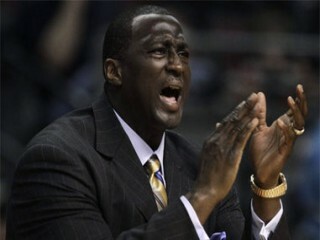 Tyrone Corbin completed his second season as an assistant coach with the Jazz after spending the 2003-04 as Manager of Player Development for the New York Knicks. Prior to joining the Knicks, he spent two seasons with the Charleston Lowgators of the NBDL as a player mentor. A versatile small forward, Ty played for eight teams during his 15-year NBA career, including three seasons with the Jazz from 1991-94, where he averaged 9.6 points and 6.2 rebounds in 233 games. His primary responsibilities include working with front-court players on skill development and preparing the team for games by breaking down video of opponents and their offensive and defensive sets. He also shared coaching duties with assistant coach Scott Layden during the 2005 Reebok Rocky Mountain Revue. Corbin played in 1,050 games during his 15-year career, including stints with San Antonio, Cleveland, Phoenix, Minnesota, Utah, Atlanta, Sacramento and Miami, averaging 9.3 points, connecting on .457 percent from the field and 4.8 rebounds in 26.2 minutes per game. He was originally drafted by the San Antonio Spurs in the second round (35th pick overall) of the 1985 NBA draft. Corbin played in 82 career playoff games, including 37 with the Jazz, averaging 8.4 points and 5.0 rebounds. He scored 11.3 in 16 games with Utah in 1991-92 and 11.8 points in five games with the Jazz in 1992-93. Corbin averaged 11.5 points in four years at DePaul University, including 15.8 points in his senior season. He played in 120 games for the Blue Demons, increasing his scoring average and field goal and free throw percentage in each of his four seasons. He finished seventh on DePaul’s career scoring list and was a two-time honorable mention AP All-America selection, as well as an All-NIT choice in 1983, and he was invited to the 1984 Olympic trials. Tyrone and his wife, Dante, have two children, Tyjha and Tyrell. He graduated from DePaul University with a computer science degree and served an internship at Merril Lynch as a financial planner during the summer of 1997.